I started blogging about beauty-related stuff late 2011 and I am quite satisfied with how things went especially my blogging activities last year. I was able to make a whopping 88 posts and to a busy (lazy) girl like me, it is something to be proud of. :D This year I am determined to outdo my last year’s performance hence I welcomed 2013 with two new posts during the first few days of the year. Additional inspiration for me is this gift pack from Dove team welcoming me as I returned to the office on the 3rd after my week-long holiday break. 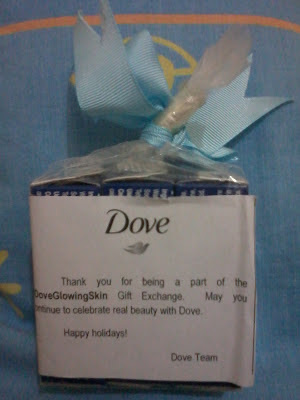 I won this gift pack from @doveph’s twitter contest titled "DoveGlowingSkin" held before Christmas. Winning an online contest is not biggie for me but I just feel really happy when I get prizes I actually use. To Dove team, thank you not just for the gift but for continuously giving us the best skin and hair care we deserve. More power and looking forward to a yearlong glowing skin with you!